As a health care professional I occasionally get asked, “How much should I exercise?” The answer to that question can vary according to your goals. Research shows it takes about one hour of moderate intensity level exercise per day to maintain weight loss. But to get health benefits such as improved mental wellness and acuity, a stronger immune system, reduced risk for heart disease and stroke, prevention of bone loss, and improved sleeping, much less exercise is required. Often times it is difficult to work 30 minutes of continuous exercise into your day. You can still get the benefits of exercise if you break it up into two to three segments of 10 to 15 minutes in a day. If you are new to exercise, you may have to start at 10 minutes a day and gradually increase your time as you improve. The general guideline is to increase your time by 10% each week. Some exercise is always better than none! Aerobic exercise- that is, any activity that increases your respiration and heart rate- is good for your heart and lungs. Strengthening and flexibility exercises help improve your overall ability to move and complete your daily tasks. How do you know if you are working at a moderate or high intensity level when exercising? The easiest way is to use your own perceived exertion rating, similar to the one used by the Weight Watchers Program. It is considered moderate intensity exercise if you are able to talk out loud, unable to sing, breathing rate is increased from normal, and you are sweating after 10 minutes while doing the exercise. During high intensity exercise you are able to talk only briefly, breaths are rapid and deep, and you are sweating after 3-5 minutes. If you want to get more technical about exercise, you can use your heart rate. Find your maximum heart rate by taking 220 minus your age. For example: for a 50 year old it would be 220-50=170. 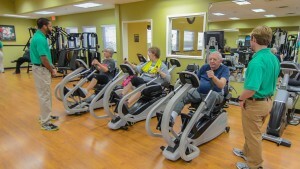 Moderate intensity exercise would be 50 to 70% of the maximum. For our 50 year old, that would be 85-119 beats/minute. High intensity would be 70 to 85% of the maximum. Again for the 50 year old that would be 119-144 beats/minute. See one of our Expert Wellness Trainers if you would like to know how to find your own heart rate while exercising. Bottom Line: Get moving at a moderate to high intensity level to get the most health benefits from your exercise program. Hope to see you at the gym or pool. Have a great workout! 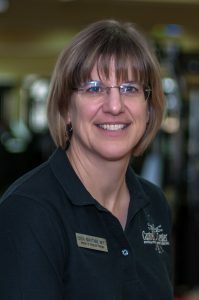 Linda Bratcher, MPT is one of our seasoned Licensed Physical Therapists who has been with the Cantrell Center for over 12 years! In her free time, she enjoys reading, hiking, swimming, travelling, and taking her dog on therapy-dog visits. Her wonderful husband, Mike, is an engineer at RAFB and part time “collectibles” dealer. Their son, Drew, (26) is a computer software engineer (programmer) at Amazon, in San Francisco, and works on the Amazon Prime music app. Their daughter, Annie (25) is an epidemiologist that works for Emory University in Atlanta. Linda, speaking on the topic of her career at the Cantrell Center, talks about how much joy she gets in improving our clients’ quality of life and helping them get back to doing the things they love to do.